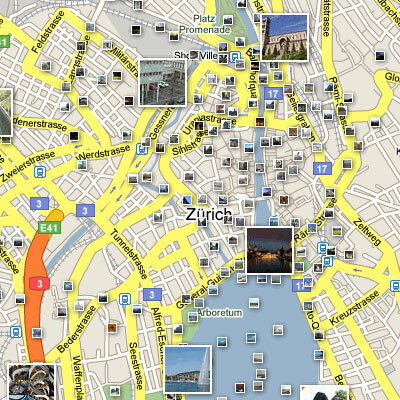 The first version was released as featured content available through the My Maps feature of Google Maps. 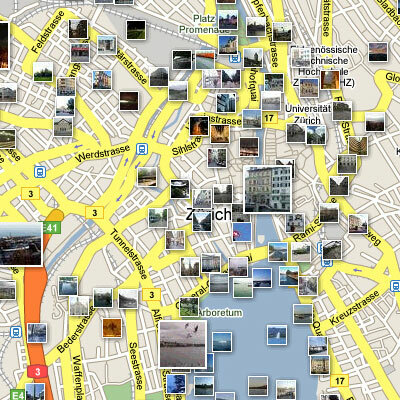 It was very cool, letting anyone see thousands of high quality geotagged photos on the map at the same time. But it had a few usability problems: the photos obscured each other, and there was no way of determining which were the interesting photos to click on. The second version was launched with prime-time positioning in the "more" button right on Google Maps. A new algorithm made sure that photos would not overlap each other, and we spilt the thumbnails into lots of smaller photos and a few larger ones to draw the eye to the more popular content. 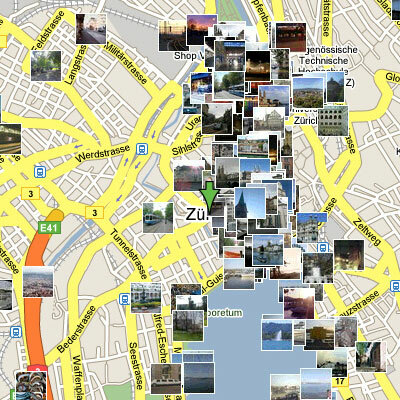 We also added a subtle drop shadow to visually lift the photos up from the map. This was overall a marked improvement but had a few interesting side-effects of its own: the sheer volume of photos was at times in danger of obscuring the map, and the prominence of the large photos was causing the eye to largely skip the smaller photos. Thus the small photos main usefulness was for indicating density, but because of the thinning it was now harder to see where the dense areas of photos were. The latest version combines the best of both worlds by shrinking the small thumbnails even smaller. Density information is once again conveyed, there is a clear visual cue of which are the important photos to look at, and the smaller photos give a clue about the content and popularity of an area without obscuring the map. I'm really happy with it!